A 47-year-old man required plasmapheresis for severe refractory pemphigus foliaceus during a prolonged hospital admission. 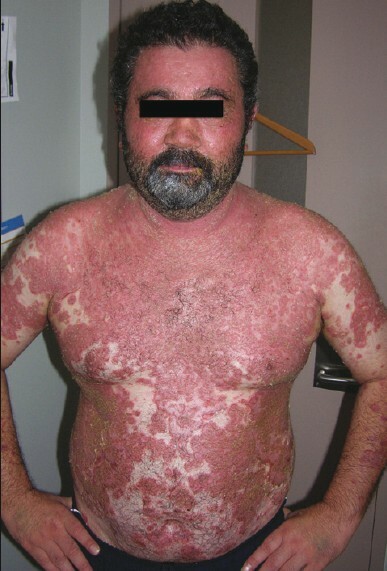 He was concurrently receiving immunosuppressive therapy with mycophenolate mofetil 30 mg/kg/daily and prednisone 0.5 mg/kg/daily to prevent rebound synthesis of anti-pemphigus antibodies following completion of plasmapheresis. Access of his subclavian and internal jugular vein was precluded by the presence of confluent ulcerated lesions over his neck and chest [Figure 1]. A femoral vein line was inserted, but after 2 days, he developed septic shock accompanied by disseminated intravascular coagulation. A routine blood film revealed the striking presence of numerous bacterial rods [Figure 2] later identified as Citrobacter koseri on culture. The tip of his femoral line was also cultured and grew C. koseri. 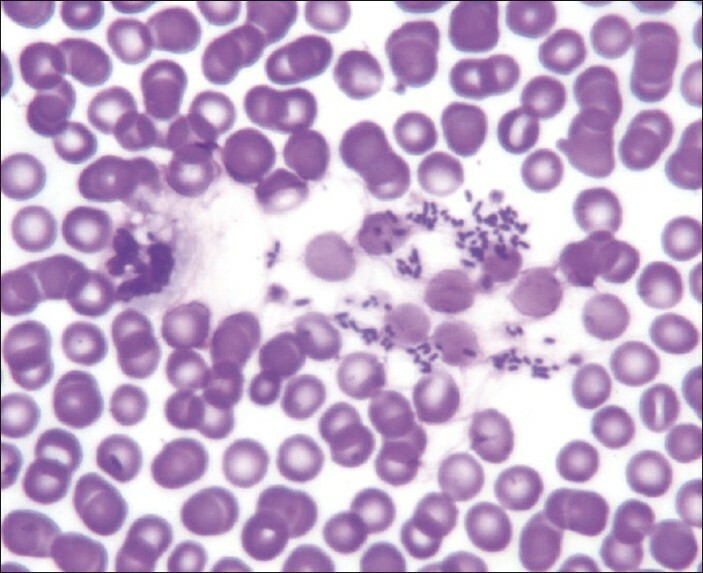 The cause of sepsis in this man was initially thought to be a Gram positive coccus secondary to the breached integrity of his skin from pemphigus foliaceus. The identification of bacterial rods on a blood film enabled the early initiation of the broad spectrum antibiotic, meropenem, prior to the growth and identification of C. koseri on culture. The patient recovered following the removal of the femoral line and a course of intravenous antibiotics. This is the first published report of a case of C. koseri infection originating from a femoral vein line. The patient's prolonged hospital stay, immunosuppressive therapy, and site of insertion of his central line were all predisposing factors to infection with this coliform bacterial organism. 1. Samonis G, Karageorgopoulos DE, Kofteridis DP, Matthaiou DK, Sidiropoulou V, Maraki S, et al. Citrobacter infections in a general hospital: Characteristics and outcomes. Eur J Clin Microbiol Infect Dis 2009;28:61-8. 2. Martínez-Lage JF, Martínez-Lage Azorín L, Almagro MJ, Bastida ME, Reyes S, Tellez C. Citrobacter koseri meningitis: A neurosurgical condition? Eur J Paediatr Neurol 2010;14:360-3. 3. Liu S, Kielian T. MyD88 is pivotal for immune recognition of Citrobacter koseri and astrocyte activation during CNS infection. J Neuroinflammation 2011;8:35.